I’m Lea Wait, and I’m so happy to be here today! But I grew up living with both my parents and grandparents. I’ve never lived in a house built after 1920, and I’m the fourth generation in the family to be an antiques dealer. The first fifty cents I earned was for booth sitting for another dealer so they could go to dinner. I was twelve. And I already knew a lot about antiques. My grandmother encouraged me to read. She took me to libraries, suggested books, and had me read Shakespeare out loud to her. She taught me to knit and do simple embroidery. I loved Victorian novels, especially those about orphaned girls who had adventures and found new families. Our homes, summer and winter, were, of course, full of antiques. I learned a lot about artifacts of the past, and the people who used them. When I grew up I worked in public relations and strategic planning for AT&T and went to school at night, earning a doctorate in American Civilization at New York University because I wanted to know even more about American culture. Like those people in books I’d loved as a child, I adopted four girls (ages 8-10) as a single parent. And, as if I didn’t have enough to do, in my late twenties I started an antique print business. Twisted Threads, the first in the Mainely Needlepoint series, published earlier this year, is about Angie Curtis, a 27-year-old Mainer who’s spent ten years in Arizona as an assistant to a private investigator, and is now back in Haven Harbor, Maine to find her mother’s killer … and work with her grandmother, who’s started a custom needlepoint business that also repairs, preserves, and identifies old needlepoint. 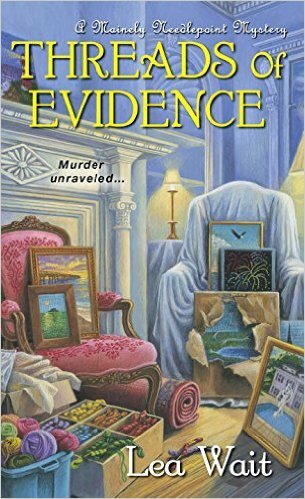 Threads of Evidence, the latest in the series, finds Angie and her friend Sarah (a fellow needlepointer) cleaning out a large deserted Victorian home, filled with needlepoint … some of which holds clues to the mysterious death of a seventeen year old girl in 1970. And at the beginning of each chapter I’ve included quotations from sampler stitched by young girls in the 18th and 19th centuries … many of which were meditations on death. Seem appropriate for a mystery series! And, besides … the worlds those girls grew up in feel like home. 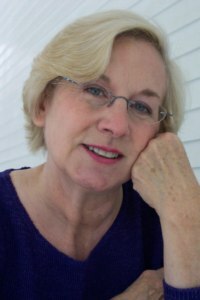 Lea Wait is the author of the Mainely Needlepoint and Antique Print mystery series, historical novels for ages eight and up, and Living and Writing on the Coast of Maine, a series of short essays on her life as a new wife and author. She often speaks at book groups, libraries, schools and conferences, either in person or via Skype. She invites readers to check out her website, http://www.leawait.com, and friend her on Facebook and Goodreads. Harbor Haven is abuzz with excitement when Hollywood actress Skye West decides to buy Aurora and sell off its furnishings. And Angie is intrigued when Skye asks her to appraise the estate’s sizable collection of needlepoint pictures. But the more she examines the pieces, the more they seem to point toward Jasmine’s murder–and the murderer–and it’s up to her to stitch the clues together. . . But can Sunshine and Aine put aside their differences to stop the murders without tearing each other apart? Sounds like a great book! I have it on my TBR list.